If you haven't already done so, this is an easy build which I can highly recommend. It opens up new possibilities by bringing some of the 4MS RCD's 'hidden' features to the fore. My original aim was simply to get front-panel access to the up/ down count and gate/ trigger switches, which normally involves unscrewing the module from the rack. I wasn't even going to connect the reset jumpers but I'm glad I did - this has a marked effect, particularly on the odd divisions. Flicking between trigger and gate mode also yields an added bonus when driving logic operations. For example, patch the /8 to Brains' 'direction' input and toggle between gate and trigger to 'activate' and 'hide' the boolean function. In combination with the reset options, this can yield some funky sequences. The Solovox Solo-Pedal-Unit was built in to Hammond's RT2 & RT3 organs to provide monophonic accompaniment/ lead voices. The picture and sounds were kindly passed on to me by my colleague, Christian. The recording was made from the direct outs of the unit that was built into his 1952 RT2. It was the first time I'd heard of the Solovox and its wonderful tones. Sadly, he'd already sold it before I could get a chance to experience this rare, tube-based instrument for myself. Worse still, apparently the new owner is a fan of 'easy listening'. Here are a few links (1, 2) to the history of the Solovox. I notice one credits Eric Barbour of Metasonix. Now, why doesn't that surprise me? 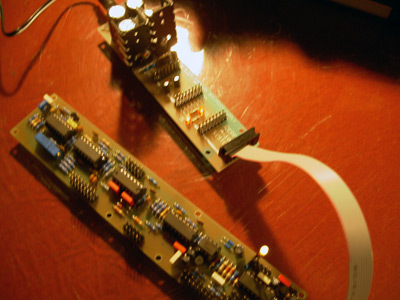 A look at the Euro-prototype of Fonitronik's unconventional ring modulator. 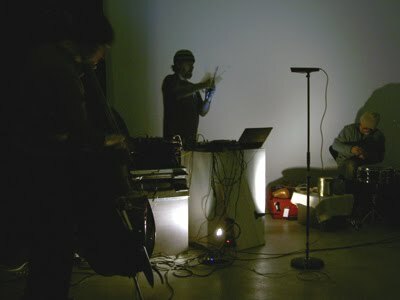 See this thread at the electro-music forum for the background to this project and Kevin Kissinger's excellent demo. "Harry Bissell once recommended Irvine's design for a ring mod. I changed the resistors to our common values, and added two VCAs to the inputs, thus giving a voltage controlled ring mod. Makes a lot of fun." Matthias's opening description in that thread might lead one to believe that this circuit is indeed just another ring modulator with the added benefit of voltage control, something akin to Doepfer's A-133 VC Polarizer. 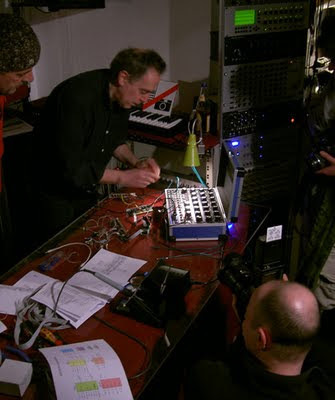 Irvine refers to his design as a 'frequency mixer' and, while I'm not sure of the the semantic difference, the sonic results certainly are unlike 'normal' RM. The term 'ring modulator' might be misleading, but that shouldn't detract from the possibilities of this circuit, both in terms of timbre and function generation. The build quality is excellent and, taken as an alternative to the classical DC-coupled ring mod, the mh31 offers new sounds and surprising results when processing control voltages. 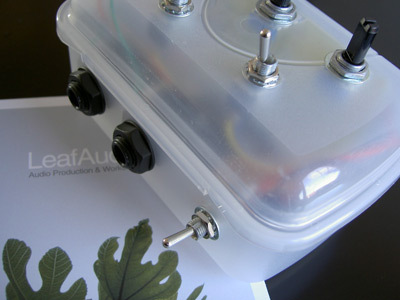 A demo of Leaf Audio's DIY distortion-in-a-snackbox effect. Described by its makers as a 'lethal lash', this deceptively simple circuit is capable of serious audio destruction. It features three gain stages, two feedback loops and adjustable power starve. It was originally designed by Leaf Audio to process electronic beats although, as you'll hear below, it's quite happy when fed with other material. Despite its diminutive size and innocuous looks, the Fuzz-O-Mat is capable of dramatic gain swings, so be careful of your ears and speakers! I've used a limiter on these recordings to keep the levels in check. The Fuzz-O-Mat is only available by taking part in one of Leaf Audio's workshops. The kit contains everything you need and the PCB is well laid out, making it fun to build. 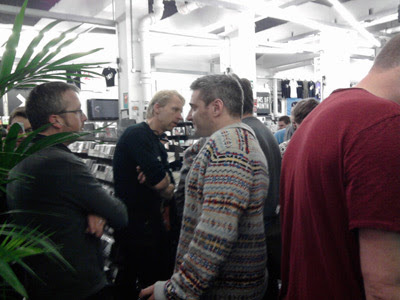 Manuel of Leaf Audio and Matthias of Curetronic are on hand to help should you get stuck. Check the list of upcoming dates and their other 'snack-box synths': the BingBong, NoiseFuzzFilter, RingDing & Bumssss analogue drum synth. The next workshop in Berlin is on the 4th December at the Haus der Kulturen der Welt as part of the Worldtronics festival, where you can also look forward to a modular set from me, quite possibly shredding pristine Cwejman sounds with my Fuzz-O-Mat. 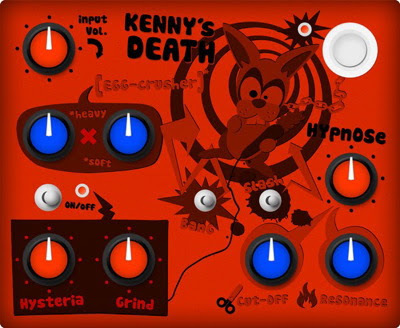 If you can't take part or would like something pre-built, head over to Kenny's Death and contact Manuel to order "the most kaputt sounding fuzz workstation ever" - a Fuzz-O-Mat with all the Hazarai. Using Maths or the VCS to generate sub-harmonic variation. "Sub-Harmonic Generator: If a series of triggers are applied to the VCS faster than the total rise and fall times, the module will divide the incoming signal by a whole number. In the audio range the output will be the sub-harmonic series." The VCS has the benefit of an AC-coupled output, but I feel Maths offers finer control over the settings. As this patch relies on the rise time, Math's EOR pulse can be used to provide an even beefier sub signal. 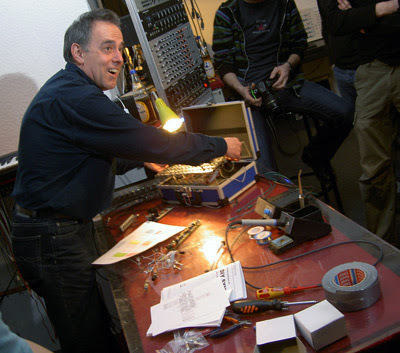 The technique simply involves patching a mult of your principal oscillator to Maths' trigger input and mixing either the envelope or EOR with the main VCO in a filter etc. Set the response to linear, fall to fully CCW and then gradually increase the rise time. Additionally altering the fall time will give you more control over the timing and hence sub-divisions. 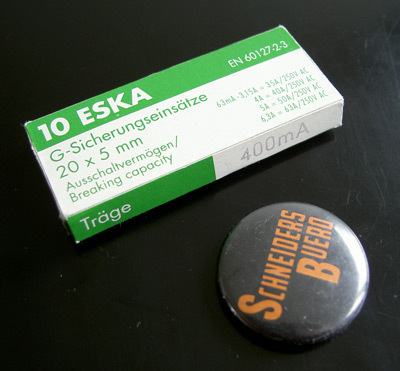 The patch relies on the envelope's inability to respond to a second trigger until it has completed its cycle, meaning it will 'skip' pulses and thus generate a lower frequency. You can try this patch with other trigger-able envelopes like the Plan B Model 10, Cwejman CTG-VC or Doepfer A-143-1, bearing in mind that the minimum possible cycle time and trigger response will affect the possible sub-divisions. 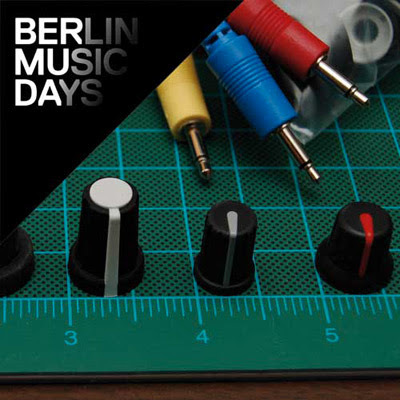 I'll be taking part in the De:Bug Musiktechniktage this Saturday, helping Andreas Schneider with his workshop and playing a short live set. Time should be between 16:00 & 18:00. See the De:Bug link for more information. 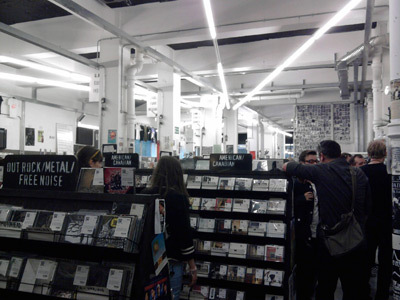 Some pictures from the opening event at Rough Trade East last Sunday. It's been a while since I've been down Brick Lane and I was amazed at the buzz on the streets. 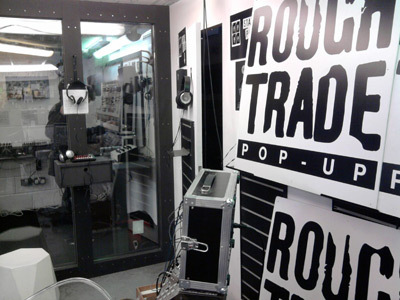 Rough Trade East is a great location for the Testsalon and I wish Andreas and the lads every success with the venture. Thanks to everyone who came along - it was great to meet you! TOP: Cwejman RES-4, MMF-1, Toppobrillo TWF, A-132 VCA, Harvestman Hertz Donut, VCA-4MX; BOTTOM: A-147 VCLFO, A-160/1 clock divider/ sequencer, Fonitronik Attenuverting Mixer, Analogue Solutions SH-NZ, Make Noise Wogglebug & Maths, Bananalogue/ Serge VCS. Above is a picture of the 6U case I took with me. I can happily confirm that it met Easyjet's carry-on luggage regulations. There was a sharp intake of breath from the passengers behind me as I opened the case at security in Berlin - the people at Luton didn't even bat an eyelid. I asked Easyjet about taking a 9U as carry-on: unfortunately, it's too big. Putting together a 6U performance case was a real challenge. My normal approach is to ensure that I have all eventualities covered e.g. VCAs, polarizers, mixers etc., but this time the solution was to think in terms of the set I wanted to play and populate the case accordingly. Anything I hadn't used in rehearsal (mults, logic, sound-shaping filters, complex envelopes etc.) was easily left out. My set comprised of three sections and relied on re-patching & repurposing the modules e.g. filter as oscillator, envelope as trigger delay etc. Rather than using LFOs, a joystick or keyboard/ Pressure Points, I made all changes manually. Section one: white noise tuned by the RES-4 to provide a pad, the MMF-1 randomly pinged by the Wogglebug (the Allen Strange 'tail-chasing' patch); section two: my faux binary zone patch (MMF-1 through TWF as bassline), RES-4 pinged by clock divider for 'Berlin-style' stabs, high-pitched waveform discontinuity sound from Hertz Donut principal as high hat, modulator as kick drum and, section three, the RES-4 excited by the VCS and run through the TWF for some distorted klonks, with the HD providing some 'stupid' accompaniment and the MMF-1 rumbling the subs. Part workshop, part gig, this was an interesting experience - despite rehearsing, the one thing I wasn't prepared for was shaky patch-hands. On more than one occasion, I missed the jack and hit the face-plate! 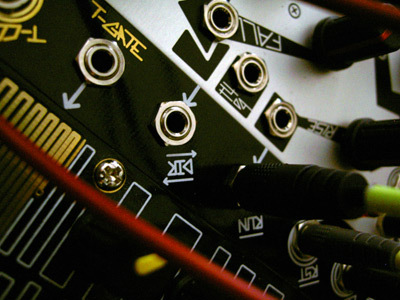 Self-contained instruments like Maths, the Wogglebug & Hertz Donut are perfect for small systems (although the latter's secondary CV inputs, which need to be activated, are hardly performance-friendly!). The biggest lesson, though, was to bring your own monitoring: if you can't hear your music properly, you can't respond. Next time, I'll be wearing headphones! 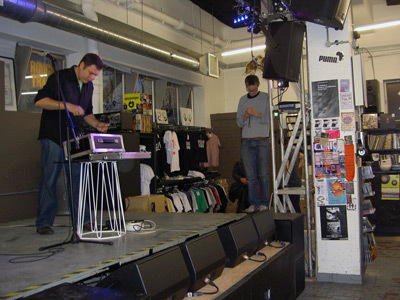 I'll be performing a short set at the opening of Schneidersbuero's London showroom at Rough Trade East this Sunday. The carry-on luggage regulations mean I'll be traveling from Berlin to London with a 6U case. It's been quite a challenge to find a happy balance between favourites and functionality, but also quite revealing to discover just what my desert-island modules are. I hope you're as excited as I am about the opening and look forward to seeing some of you there! Imitating John Blacet's complex staircase generator with Eurorack modules. 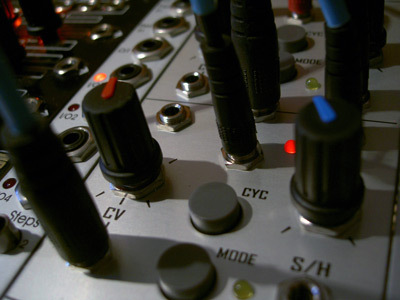 My first modular sequencer consisted of an A-160/ 1 clocking combo and a mixer. Patching four outputs of the A-161 to an A-138 and then on to a VCO was simple but fun. I don't know why it's taken me so long to realize that I should have tried the clock divider's outputs too! The principal difference is that, while the A-161 will yield single steps, the A-160's gates will push and pull the sequence higher or lower depending on the mix levels. This results in a variety of the number of steps and the overall sequence length. The Binary Zone offers six clock divisions. Using a polarizing mixer like the fonitronik mh-01 will limit you to four, but if you substitute the A-160 with a 4MS Rotating Clock Divider, you can generate some very interesting shifting patterns. 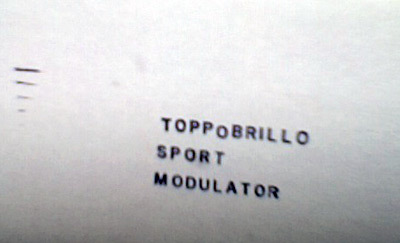 Featuring the Toppobrillo Sport Modulator as VC divider and Triple Wave Folder as VC Multiplier. Today's PotD is based on the 'VC divider' patch with the added twist of a multiplied pulse train courtesy of the TWF. Mult your clock source to four destinations: the TWF, Env1, SM1 S/H and SM2 S/H. Set both sections of the SM to cycle in 'hold' mode, send the output to two VCOs (in this case for pitch and PWM) and the End Out to envelopes 2 & 3. Take the TWF's pulse output to trigger a fourth envelope. 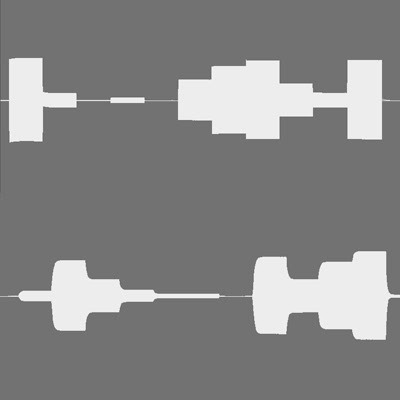 In the recording, the first sound you hear is paced by the source clock, the two VCOs by the divisions generated by the SM and the hi-hat by the TWF stream. You might not want the pitch changes generated by patching the SM's outs to the VCOs, but in this case it allowed me to generate some noise bursts by flicking each section's mode button from S&H to lag and hold. I also added some variation to the patch by sending three CV variables from Pressure Points to the two Toppobrillo modules. For more patch ideas, see the Sport Modulator page and manual here. Mixing envelopes for tailor-made transients. A follow-up this post. Cwejman VCO-2RM (+ sub ex A-160) > Borg filter, ADSR-VC2 + Bananalogue VCS > Fonitronik polarizing mixer > Borg. Gate to both envelopes. Pitch CV > VCOs + Borg 'key in'. Makenoise Pressure Points row 1 offsets pitch of oscillator 2, row 2 > VCS VC rise. This is a simple but effective solution without getting into the complexities of patching-up a time/ level envelope as found on the Korg Poly 800 or Roland JD-800. If you did, however, want to try this, the Maths, Brains/ Pressure Points and Doepfer A-143-1 manuals all offer examples. A couple of action shots of the Toppobrillo Sport Modulator. Mounted alongside Maths, PP + Brains, A-151 & Choices, the SM makes a great addition to the team. Sport Modulator - Staircase to Heaven? An overview and demo of the Toppobrillo Sport Modulator, a dual lag + hold/ sample + hold CV processor and generator which takes its cues from a classic Serge design. 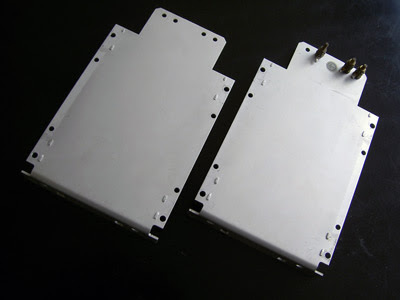 The Sport Modulator features two identical but related sections, both of which are capable of smooth & stepped functions, low and audio-frequency oscillation and pulse streams. For more information and patch tips, see the product page and the SSG Wizardry section of the Serge Fans site. LFO sine > SM in. SM out > VCO. Manual modulation of slew rate. Then pulse from same LFO to 4ms SCM, x8 out > SM T/H in. Lag + Hold mode first, then S+H. Hi hat provided as timing reference. Bottom section cycles, end out provides T/H trigger for top section. Manual tweaks. Both sections cycling, top > bottom S/H in, comparator out > bottom CV in, bottom end out > top CV in, bottom out > VCA. 2 VCOs. One receives all notes, the second gets timed 'grabs': the main sequence is 8 notes long. Taking a shorter or uneven division from a clock divider causes the S&H to grab a different note on each pass. After about 40 seconds you can hear the difference between S&H + T&H modes: the latter lets the note stream pass while the gate is high and then holds the last note when it goes low. The second part of the recording, after 1 minute, uses the SCM to generate triggers at a faster rate than the main clock, opening the doors to staircase madness. I have to admit, I spent the first five minutes staring at the Sport Modulator not knowing what I was supposed to patch where. The SSG tips were a great help, although there are some differences between the two. Firstly, as mentioned, both sections of the SM are capable of both smooth and stepped functions making it more flexible than its ancestor. However, the SM's cycle function is not gate-able so, while the cycle button provides convenience, some patch possibilities may have been sacrificed. The build quality and layout are great and the circuit does indeed hold for quite a while without noticeable droop. Cross-modulating two cycling sections can generate chaotic repetitive patterns, with the comparator output documenting the two oscillators' struggle. An LED for the comparator output and 'attenuverters' for the CV ins would have been useful, but their absence in no way spoils the fun. 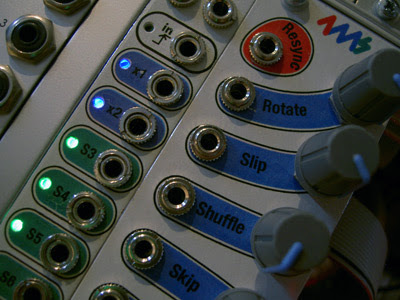 Like the Wogglebug, which covers some of the same ground, the Sport Modulator is greater than the sum of its parts and the musical results are unique. Today's Patch of the Day showcases some of the features that make the combination of Brains, Pressure Points and Maths such a flexible & tactile sequencing package. Cycling Maths Ch1 acts as clock. EOR > Brains CLK. Envelope controls VCA depth + VCO FM Index. Maths Ch4 slews Press CV from PP buss (use input, not trigger). R + F ca. 15:00, exponential. Slewed CV > VCA (dynamics), Brains 'Run' + Maths Ch2. Patch PP rows 1-3 > sequential switch. PP row 1 gate > A-152 clock. 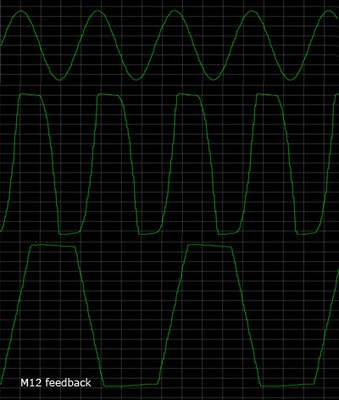 Digital out 4 > reset, common I/O > quantiser > VCO. Although Maths is cycling and providing Brains with a clock, the sequence is blocked from running until the press CV exceeds 1V. 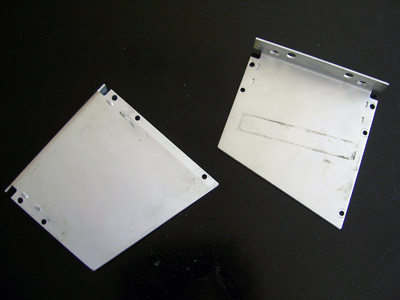 On release of the touch plate, the Press CV fades out, allowing the sequence to continue running until it again falls below 1V. An inverted mult of the press CV, which is fed to Ch1's Fall VC via Ch2, controls the speed of the clock. The harder you press, the faster the clock. As the press CV fades, the clock slows. Try different rise and fall times for both channels 1 + 4 and the amount of fall VC from Ch2 to taste. You could, for example, have the sequence get faster as the volume fades. The remaining connections (Ch4 EOC > Brains reset, PP rows 1-3 > multiplexer etc.) are non-essential, but nice. Brains provides sequencing power to Make Noise's Pressure Points, offering some of the functionality of the classic Serge TKB. For a full description, see the product page and make sure you read the manual! I'd never have thought that such a small and seemingly simple clocker could open up so many possibilities. Nice work work, Tony - Brains, Pressure Points & Maths make a cracking team! Here's a quick example using the stepped out of a Wogglebug to change the direction of a four-note (i.e. one row) sequence. When the random voltage is above 1V, the sequence runs forward. When it's below, it runs backwards. At about 23 seconds, the /6 output of a 4ms RCD steps a sequential switch to add rows 2 & 3 to the chain, creating a 12-note sequence. Brains comes with all the necessary cables to connect the unit to two Pressure Points as well as chain the touchplates and is available now from Schneidersbuero. I'll be taking a closer look at the possibilities offered by Brains later in the week. In the meantime, if you have Pressure Points, do yourself a favour and get this module. It's … a no-brainer. 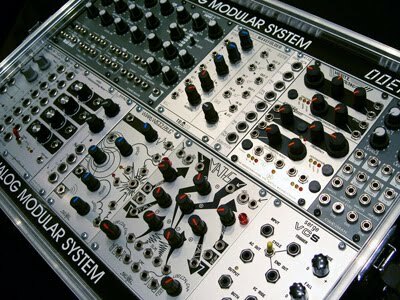 Got a spare 3U rack that you'd like to use on your desktop to house performance modules like Pressure Points and Choices? Screw them back in place and enjoy! Thanks to Max Kruppa in Kreuzberg for their time and effort. I've just released The Best of Patch of the Day Vol. 1, which is available from my bandcamp page for three Euros. The EP contains some patches from the past plus one new recording. 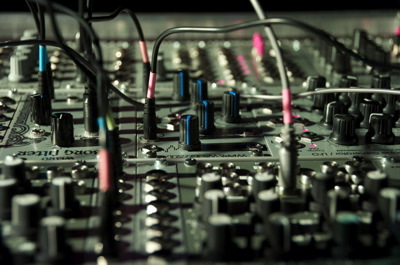 Prebloom is a live performance featuring a Cwejman RES-4 & CTG-VC, Toppobrillo TWF, Doepfer A-143-1, Plan B Model 15 & Harvestman Hertz Donut VCOs, Makenoise Pressure Points and f(h) Choices joystick. I'll leave you to figure out the patch configuration from my previous examples! Some patch ideas featuring the 4ms Shuffling Clock Multiplier and Breakout box. For an overview of the concept and functions of the SCM, see this post. 2 VCOs, left gated by keyboard, right by manually-clocked SCM. The shorter the intervals between played notes, the faster the trills. Here's a variation on the above using a tail-chasing Wogglebug to generate gate and pitch information. I used the x1 output of the SCM to trigger Maths and fed its envelope to the level VC of a Cwejman CTG-VC to fade out the echos. This works better in the slower sections i.e. the beginning of the clip. An option would have been to VC Maths' fall time with the pitch CV e.g. higher notes = faster echos = faster fade. 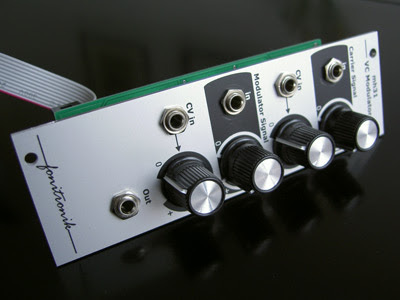 If you don't have a Cwejman envelope, you could use a second VCA to add similar dynamic control of your your envelope. Because the SCM 'reads' the interval between two pulses, large timing changes from fast to slow will display an amount of lag as the SCM catches up with the new tempo. This is possibly the only failing of the module but, given the difficulties in implementing clock multiplication (the SCM can't 'predict' the new tempo before it has happened! ), two taps are more than acceptable and this lag can also have its musical uses as a 'ghost' beat. LFO as clock, speed manually changed. The most obvious use for the SCM is as a drum trigger/ sequencer driver, but this last recording is an example of the SCM in an auxiliary role, helping to time the changes of a quantizer to generate sync'd glissando. Main VCO left, clock reference right. At six seconds a slewed sequence is patched to the VCO. At about 18 seconds the sequence is re-patched to an A-156 quantizer. The quantizer responds to changes in voltage, so the steps are not in sync with the main clock. Patching an output from the SCM to the A-156's trigger input (27 seconds) resolves this and, with some rotation and slip, allows for swung or odd time glissando. The SCM and breakout box have undergone some changes since I tested the prototype. The main differences are the addition of a x1 output, or mult of the clock source, and the loss of some of the 'straight' gate streams. I found the former to be useful on the RCD and, because the SCM generates pulses even without an input, it can function as a main clock source in a patch. The lack of some of the 'un-swung' outputs means you'll have to rotate the SCM if you want to make use of the phasing effects I demonstrated in my original post. The Breakout box has also undergone some changes, now offering a global x4 multiplier and mute function. As I previously noted, if you have an SCM, you really need the expander. Not only does it offer access to the swing & skip parameters, but it brings the SCM to life as a playable instrument. The breakout box should be available soon, so plan for one in your rack! 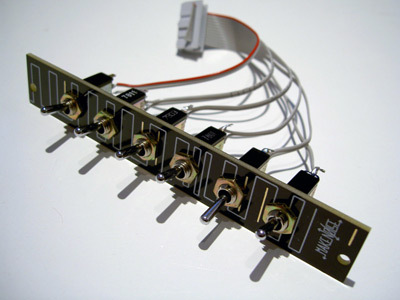 Got a spare A-180 multiple and need a simple slew to round off jaggy gates and S&H signals? 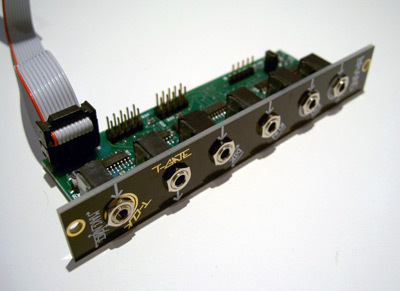 Then get out your soldering iron and follow this simple schematic from the Doepfer DIY page. Filters also benefit from 'softer' control. I built this as a companion to my Plan B M23 ASR, but you could also feed the quad slew with the outputs of a clock divider like the 4ms RCD and take these outputs directly to your VCA. A cheap and small alternative to tying-up four envelopes! I used a 4k7 resistor and 1uF capacitor, but you could try other values for a more or less rounded result. Thanks to fonitronik for the suggested values and help! Recordings of the quintessential Cwejman module, the Quad VC Resonator. Download the album for €1 or more to access the audio examples. For an overview of what the module does, read this Sound On Sound review and for some practical tips on how you might use the RES-4, read this chapter of the classic Synth Secrets series. 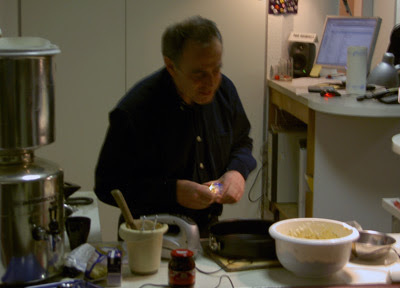 If the formant techniques described by Gordon Reid sound too much like hard work, you could, of course, just patch a sawtooth into the RES-4, twist the knobs and see what happens. Listen to the 'Oriental' and 'Formant' examples. 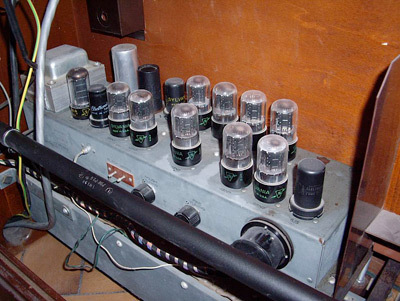 The recordings not only show off the sort of vocal effects the RES-4 is capable of, but also the stereo spread caused by the phase cancellations and additions of the four filters when mixing the BP and Notch outputs. 'Voice' and 'Breathing' are similar, using higher Q settings for some resonant phasing. 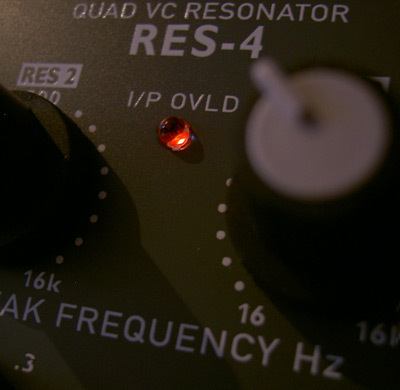 As you can hear, the RES-4 can be used for frequency-dependent panning. 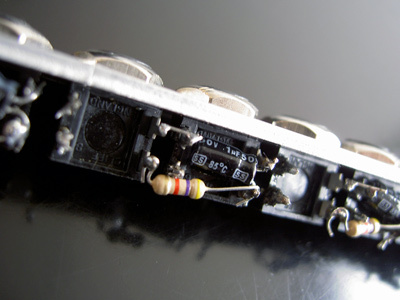 Unlike the MMF-1, the RES-4 needs an input to start oscillating or ringing. A little white noise or short trigger impulse from Maths' EOR does the trick nicely. Listen to the 'Ping' and 'Shiftregister' examples. For me, this is the quad resonator's trademark sound. I know it drives some people nuts, but I love it. Higher Q settings will yield longer rings, using Pressure Points or an analogue shift register allows you to play four-note chords or complex cascades. Feeding the result into a wavefolder can add bite or bring out steel string-like qualities. Tuning the resonant frequencies and adjusting the gain levels gets you into physical modeling territory. Listen to the 'TWFolded' and 'Logdrums' examples. 'Spacejam' show-cases some of all of the above. It's a single pass, live recording featuring just one VCO, the RES-4 and maybe a touch too much EHX SMMH delay. When the oscillator is slow and the Q high enough, the filter is pinged. At audio rates, the effect is similar to the first couple of recordings. One last feature that should be mentioned is the amount of voltage control this module offers: frequency and volume on master or individual level, bandwidth per filter. As stretta expertly shows, this allows dynamic and precise settings, although so far, I've been happy enough making manual changes. I ignored the RES-4 for many years, in part due to its price, but in the time that I've had it has become a firm favourite. The build quality is top notch and the sonic results unique. For more RES-4 examples, listen to the 'dampf', 'nutong' & 'eszieht' tracks from my Synthetic Nature EP or run this search. 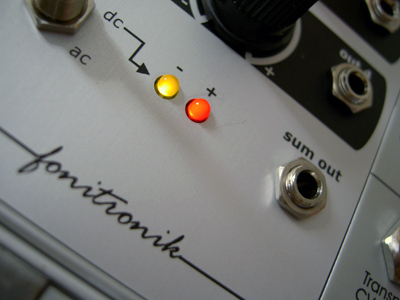 Abusing the Fonitronik Attenuverting Mixer as a fixed-rate slew limiter. Mixing CVs can yield complex modulations. Fonitronik's mh-01 is perfect for the task and also has a hidden trick up its sleeve. Flicking the mode from DC to AC sends the sum through a capacitor, which leads to a pleasant and unpredictable rounding of the signal. 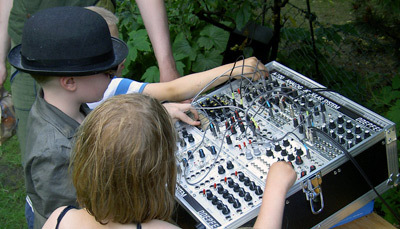 Two mixed LFOs. Change from DC to AC mode @ 8 seconds. This is great for cyclical modulations and, while it's less useful for pitch information, can also be used to avoid clicks when feeding a VCA with a S&H signal. ... they just get it. Thanks to everyone who came along on Saturday - I hope you had as much fun as I did! I'll be performing live as part of the Bloom Garden project at the 48 Stunden Neukölln arts festival in Berlin this Saturday (June 26th). 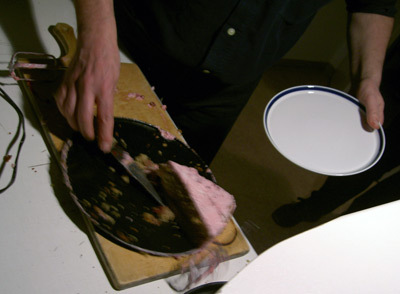 I'll start patching around 16:00 at Parzelle 20 in the 'Hand in Hand' Kleingarten Kolonie in the Rütli Strasse 8, 12045. Same procedure as last year, as they say in Germany! I hope you like the sounds enough to buy the EP and, if you can tear yourself away from the football action, look forward to seeing you on Saturday. Mixing envelopes to emulate a reverb pre-delay. 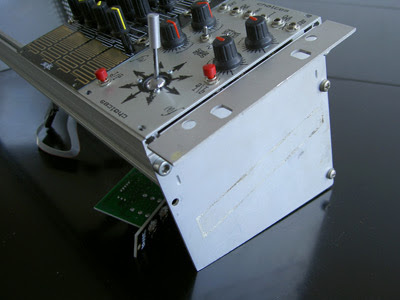 In this patch, I used a Doepfer A-143-1 for its built-in polarizing mixer, triggering both envelopes with the same gate, but any combination of envelopes and mixer would do. You could of course also do the reverse and, using a positive envelope, add a second attack or 'bite' (e.g. trumpets) or flutter (claps) to a sound. See the A-143-1 manual for more ideas. An overview of the updated 4MS Rotating Clock Divider and a taste of the company's next product, the Shuffling Clock Multiplier. I liked the RCD when I first tried it, but missed the ability to output gates and, more importantly, wished it could count on the downbeat. This latest update delivers both features and makes the Rotating Clock Divider perfect. Downbeat counting. /1, /2 & /4 outputs drive three envelopes, Pressure Points rotates. Similar to the above, but with gates rather than triggers. This third recording demonstrates an interesting side effect of the way the RCD generates its gates in upbeat mode: the /1, or mult of the source clock, is inverted, resulting in a funky offbeat. The first half of the clip is upbeat the way we know and love it from the A-160 (source plus /4), the second half is the RCD. If you want a 'normal' upbeat division to play against your source, take the mult directly from your clock rather than the RCD. Upbeat + Gate. A-160 then RCD. I've been very lucky to have had the beta versions of the Shuffling Clock Multiplier and SCM Breakout for testing. In the past week, I've had so much fun twisting rhythms that I'm sad to have to send them back. The final feature-set and layout will likely change, so I won't go into any great detail. Suffice it to say, that rotating, shuffled clock multiplications are an even bigger hoot than divisions. The SCM takes an incoming clock and multiplies it. These multiplications are available at separate outputs and, like the RCD, these can be rotated. The x4, x6 & x8 clocks have twin outputs, and these can be played off against each other for swing and drop-out effects. Lastly, you can also modulate the pulse width of the resulting gates. Left = x4, right = S(x4). Slippage altered first, then shuffle, then both. These functions are related: one determines the amount of swing, the other which beats are swung. Same as above. Skip selects which beats are 'dropped'. For more details on the SCM see the 4MS website and Youtube demos. Two VCOs, SCM, quantizer, analogue shift register and a couple envelopes and VCAs. 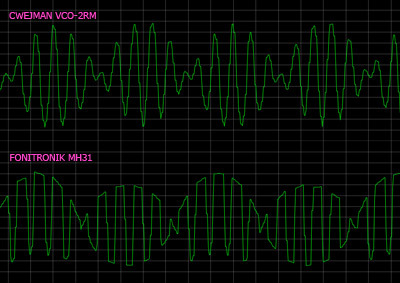 Sequence sent to VCO1 (left) and multed to the ASR which is clocked by the S(x4) output. The shifted clock and pitch information is sent to VCO2 (right). 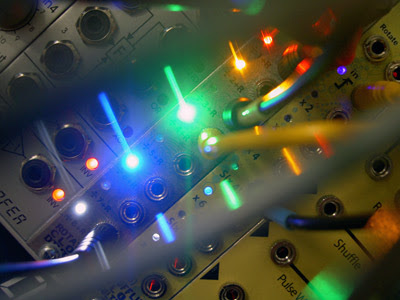 Manual tweaks of the clock, SCM, ASR output and quantizer scale. Thanks to Dann of 4MS for the updated RCD - I can't wait to get my hands on the final SCM! A quick comparison of the Malekko Wiard Borg 1 & 2, also featuring Plan B Models 12 & 13. 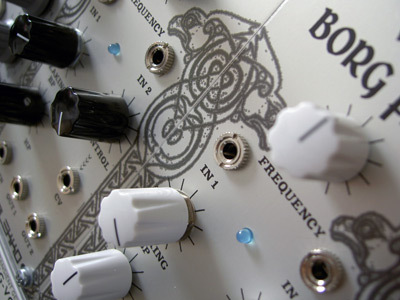 The Borg 1 (white knobs) employs slower vactrols, allegedly giving it a mellower sound and longer decay than the more aggressive, black knobbed Borg 2. I'm a big fan of the Plan B Model 12, but sometimes find it's response to CVs either too linear or lazy, so I was keen to hear the Borg 1 for myself. I really liked the Borg 1's soft edges and muted tones. Its response is slower than the Borg 2 and this makes it a more natural sounding LPG. It might even have the edge on the M13, which tends to lose the initial transients. I don't find either Borg particularly useful for BP or HP duties and this is where the M12 shines. I tried patching both Borgs in a BP series, but didn't find the results as interesting as the dual-peak BP mode of the Cwejman MMF-1. That said, both Borgs are fantastic LPFs with attitude and character. Sonically, the B1 sits squarely between its more aggressive sibling and the rubber-funk of the M12. You can download the full set of recordings, including the obligatory LPG 'thwap' test, here (3.2MB), but be careful with your speakers on the 'rumble' MP3! Thanks to Schneidersbuero for the loan of the module. If you're in Berlin tonight, be sure to check out Richard Scott's trio at the Sowieso in Neukölln. Patch a square wave LFO to the A-119's asymmetrical input, set the input gain so that no clipping occurs and then adjust the threshold level to attain a 'clean' signal from the gate out. Because the A-119 features a full wave rectifier to accomplish its envelope following duties, the negative half, or 'off' period, of the square wave is flipped into positive territory, in effect doubling the frequency. There is a slight delay to the doubled clock, but this is understandable due to the speed of the A-119 and the threshold necessary to avoid a standing, permanent gate. Feeding the wave multiplier with a triangle wave will yield different clocks. For more wave-folded beats, see this post. 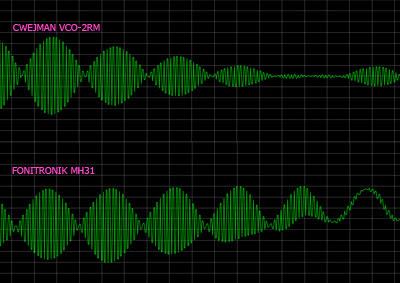 Getting the Plan B M12 SVVF to self-oscillate and 'sine-shaping' à la Bubblesound µLFO. An update to this post and part of my ongoing drive to sell the Doepfer A-133 VC Polarizer. I'd be interested to hear from any µLFO users whether the sine-shaping also causes a change in frequency as per my examples. 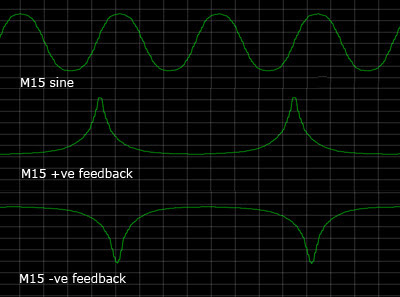 The sine output of the M15 was used to FM the M12. The output of the filter was also sent to the sync input of the VCO, resulting is some pleasing, if groggy, harmonic stepping. First impressions of the 4MS Rotating Clock Divider. This colourful module is an update on the classic clock divider design, offering even and un-even divisions of 1 to 64 and a unique rotate function to shift the resulting triggers along its eight outputs. Here's a run-through featuring four voices. Towards the end, a random CV is applied to the rotate function. The next example focusses on the rotate function, which is addressed via a CV. While this is more complicated than stepping with a gate, it allows programmed timing-changes with a sequencer or preset controller like Pressure Points. The RCD outputs triggers, rather than gates. This is useful for percussive material, but has implications for certain logic gating functions. In this example, the main clock is AND-gated by the /4 output, first with a Doepfer A-160, then with the RCD. The RCD will also function as an audio sub-divider. Here too, the results are different to the A-160 because of the lack of gates. Sine wave source mixed with 'divided' signal. Choices joystick used to first rotate and then also change pitch. 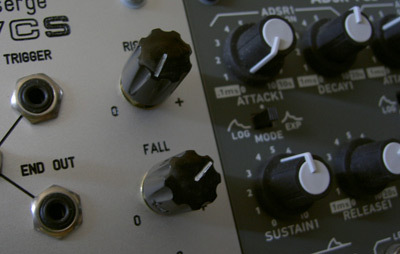 The following example uses the RCD as a simple three-voice sequencer. The clock is reset on the first beat of the bar until the 1:25 mark (shortly after the FM index riser). Thereafter, the divisions are allowed to run free until about 1:50 (after the decay of the open high hat is lengthened) when it is snapped back into sync. A joystick was used to provide the rotate CV. This was a lot of fun, but it did highlight an issue common to both the RCD and A-160: neither play 'on the one'. This is apparent when the drums are faded in (0:30). The cymbal denotes the down-beat, the RCD is playing off-beat. This can be 'corrected' on the A-160 with a logic inverter but, as the RCD outputs triggers, this is not possible. Another thing that became clear was the need for some planning with a programmer to set appropriate divisions, rather than wiggling a joystick! The RCD got me thinking and working in a way I hadn't previously and I wanted to see whether the A-160/ 1 could compete. 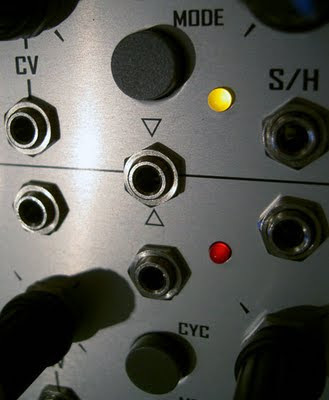 In this recording I mimicked the previous patch with the Doepfer clocking modules and fed four different reset triggers via an A-151 sequential switch which I stepped with a manual gate. This resulted in less drastic changes than rotating divisions, but the shifting rhythmical patterns were no less musical or interesting. I also got the impression that the Doepfer divider had a bit more 'funk' than the 4MS, but this might just be down to timing inaccuracies on the part of the A-160. The 4MS Rotating Clock Divider is mesmerizing, immediate and a lot of fun. Having easy access to un-even divisions was a revelation and the reset possibilities allow for complex rhythmic patterns. I'm not sure I'd want it as the only clock divider in my system, but it could certainly fulfill that role. To wrap things up, today's Patch of the Day features the RCD and Plan B's M23 ASR. Two VCOs, panned left and right receive shifted pitch and trigger information. A Wogglebug provides a random CV to rotate the RCD, modulate Maths' envelope length and transpose the sequence. Today's tip is adapted from Rob Hordijk's excellent Nord Modular tutorials. Hordijk's patch is a little more involved, but in the second example I simply used an inverted output of the A-160 to trigger the S&H. 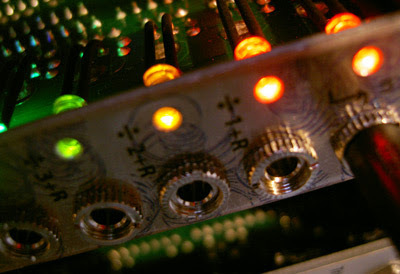 Another option would be to use the 'step1' output of an Analogue Solutions SQ8.